Since the day when this theme was created, it has been increasingly becoming popular among people, especially web designers. This Free Premium Wordpress Theme is available and compatible with the latest version. The Grey theme was build to have an elegant, out of the box design and strong layout structure. This theme is a free version. This theme is generic enough that can be used for almost any kind of blog or niche. It does not matter the type of blog you want to design, it might be your own private blog, photography blog, fashion or any other area that you are passionate about. The theme will suit all your needs. The thing that makes this theme one of the best is that it is built on a simple layout. However, it has lots of little touches of subtle detail and texture. The menu is customizable with the menu editor tool in the WordPress. 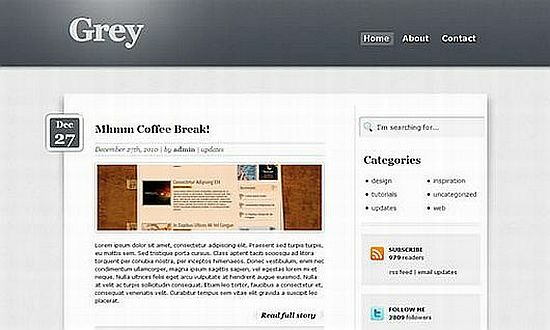 Therefore, if you do not create the custom menu, the layout loads the blog pages. The footer is divided into three main areas.These main footers are Flickr stream, twitter timeline and social box.